Pseudoainhum is a rare and poorly characterised phenomenon involving autoamputation of a digit associated with an identifiable or related disease process. Ainhum does not have any predisposing condition associated while pseudoainhum is associated with predisposing conditions like trauma, leprosy, scleroderma, and diabetes. 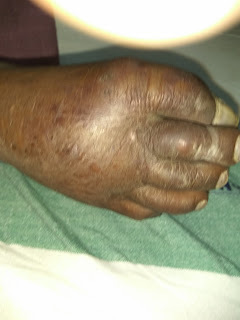 Other diseases which can cause pseudoainhum include psoriasis, scleroderma, and Raynaud disease. The constricting bands of pseudoainhum can also occur secondary to scar formation from trauma, burns, and other injuries. These photos are of a female patient aged 36 years. She was a known case of traumatic paraplegia and congestive cardiac failure. 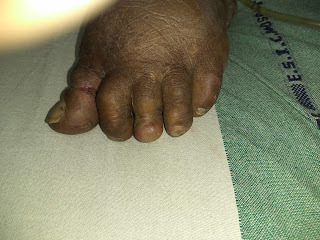 The disease process was bilateral involving multiple toes. Ainhum: A Spot Diagnosis. Barve DJ, Gupta A. Indian J Surg. 2015 Dec;77(Suppl 3):1411-2. doi: 10.1007/s12262-014-1160-0. Epub 2014 Aug 28.